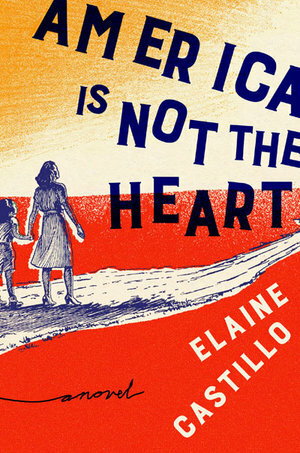 Elaine Castillo's debut is a rich and disturbing banquet of the Filipino immigrant experience in America. "As for loving America or not loving America, those aren't your problems, either. Your word for love is survival." It's a little jarring once the bulk of the story starts and we're introduced to the main protagonist, conveniently named Hero De Vera. She's living what she sees as her third life, now. Is she the woman we met in the Prologue? It's unclear. Perhaps that woman was Hero's (real name Geronima) mother. We know Hero's father was politically connected in the Philippines, and we know he disowned her after she made it to the United States. She settles in California, in a life with Pol and Paz (Uncle and Aunt) and their seven-year-old daughter Roni, "…a young girl with raw leatherlike scars covering half of her face, her entire neck, and down both of her forearms…"
Hero herself is riddled with the aforementioned eczema and the added complications of having her hands mangled during her life as a political prisoner. It's this burden of imperfection that compels us to learn more about this and other characters and see where they will go. The untranslated Tagalog, Ilocano, and Pangasinan words and phrases can make reading this a bit jarring, but it's in keeping with the apparent mission of this novel. We are in this world and of it. There's nowhere to hide, and the patient reader experienced with immigrant narratives should quickly be able and willing to learn and adapt. Castillo's title is a wise and informed twist on Californian poet and labor organizer Carlos Bulosan's 1943 autobiographical memoir novel, America Is in the Heart. Bulosan claimed "it was a crime to be a Filipino is California", and his book traced the route of subsistence farmers coming to the Golden State from what was then the American territory of the Philippines in the poor and desperate times of the Great Depression. For Bulosan, the possibility of America was in the heart, the core of potential human kindness. For Castillo, the basis of what it means to be American, or how we are best to identify the country, rests elsewhere. At first glance the title might seem defiant but it proves hopeful by the end of the novel. The environment Castillo creates is early '90s California, the pre-Silicon Valley Milpitas suburb of San Jose, where the potential for success seemed strong. Hero, known in the Philippines as Nimang and also Geronima, is best understood by her current incarnation. In California she is Hero, (christened such by her feisty seven-year-old cousin Roni), in her mid-30s, a sexually fluid woman in an era when that term was not used. Hero was radicalized 20 years earlier, under Ferdinand Marcos' martial law. She joined the communist rebel force the New People's Army and served ten years as a doctor in the mountains of Isabela until captured and tortured by the military. This explains the mangled thumbs she brings, like a horrifying souvenir, with her to California. She was tortured because of her life born to a rich, pedigreed family. Even the name of her hometown, Vigan, in the northwest province of Ilocos Sur, was enough to make her University of Manila classmates stand back and take notice. The warlords and merciless rulers of that region were Godparents, neighbors, and trusted friends. It's a jarring experience for any character to understand, and Castillo does a good job illustrating the near impossibility (it seems) of being able to switch from a life in which steadfast comrades in arms could think nothing of putting "…a knife of the chest of a mayor or landlord on a regional bus and walk away with no injuries…" to a life shuttling her little cousin Roni to and from school. Hero is a cashier at a strip-mall restaurant and a tourist in her own life, where she learns how to routinely separate her need for the act of loving from the more difficult job of connecting with lovers. She spends time with men, but she's most willing to surrender her vulnerability to women, particularly Rosalyn, a make-up artist whose willingness and ability to match Hero's boldness is intriguing. "Hero had never been a romantic. She'd never been someone who fantasized about dream lovers… She neither smoldered nor was coy… She liked silence…"
There's a lot of righteous anger weaving through Castillo's prose here, and readers need to understand that while navigating through the many characters and situations in America Is Not the Heart. Hero has found a home in the title country, a land whose historical crimes against her birthplace and its people (like the introduction of waterboarding) are numerous. While we need that back history, it can become overwhelming through the course of this thick novel. The better part of Castillo's style, the stronger agents of her anger, come when she turns the mirror inward and slams intra-racism within her widespread community in California, where an undocumented Filipina housemaid is kept prisoner by her white family employers, where pale white skin is held highest above anything else, and where insults are freely flung at those in the lower economic class with no consideration of the consequences. "I was part of the New People's Army for around ten years. I got captured. I was in a prison camp for two years. It happened there. That was something else to discover, then-another of the funny, dug-deep, wrenched-open, torn things: it was possible to say it, just like that, in four sentences, easy, short, in a backyard with someone she'd known for only a couple of months." "Hero had no truck with people for whom the heart was a dreamt-up thing, held together by divine saliva, a place where gods of love still made their beds. A heart was something you could buy on the street, six to a skewer or piled on a square of foil, served with garlicky rice and atsuete oil." America Is Not the Heart is an at times confusing, confounding, rambling novel that puts too much on its plate and can result in indigestion (or even heartburn) as we roll through voices, languages, times, tenses, and locations. Fortunately, Castillo's ambition and scope is admirable enough to allow the reader to understand that the ride will be logical. The ride has a purpose and the broad scope of Castillo's determination is enough to convince the reader that the heart of this debut novel is both a fabrication and tangible actualization of a rich story whose potential to continue is infinite.